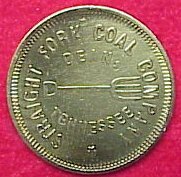 Scrip, as used in coal mining, was essentially a credit system. 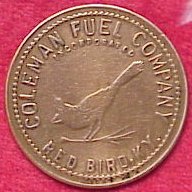 When an employee needed a pay advance to hold him over until the next payday he was given an advance in company scrip which was good only at the company store. This advance was charged against his payroll account and was deducted from the amount due at the next payday. 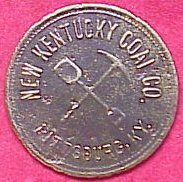 In order to obtain cash some miners sold their scrip at a discount. 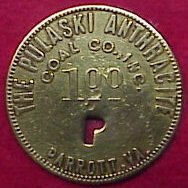 Since payday was generally once every two weeks or once a month it was necessary for most miners to use this credit system, which had the advantage for the company of making captive customers of its employees since the scrip was only good at the company store where many companies inflated prices so that they made a healthy profit from the coal they sold and from the goods their employees bought at the company store. 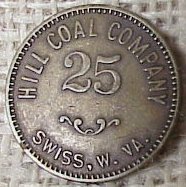 Coal scrip was generally in the form of metal tokens, paper punch cards and ticket books. 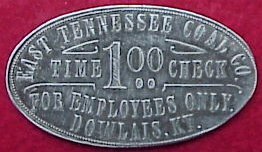 The Tennessee Ernie Ford song "Sixteen Tons" with its line "I owe my soul to the company store" refers to this credit system. 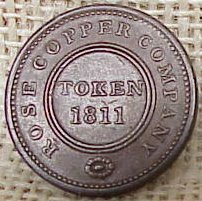 Scrip tokens began to be used in the U.S. in the late 1870s and continued in use into the early 1950s. 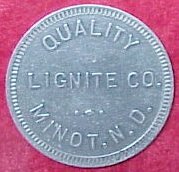 Outside of the coal mining areas paper "money" issued by the mining companies was used in areas where cash was not always readily available such as the Lake Superior Copper and Iron Mining Region in the 1860s and 1870s. 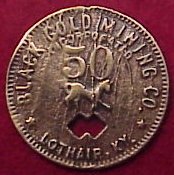 Here the company issued scrip was accepted throughout the region as legal tender and was accepted by merchantile establishments other than those owned by the mining companies. 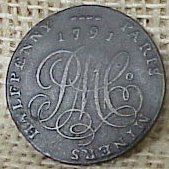 In Europe, scrip tokens were used much earlier than in the U.S., beginning in the 1700s. 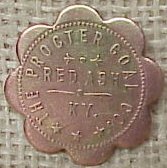 The second reason they did not circulate was the counterfeiter, who would gather up the new issues, melt them down, and make 2 or 3 lightweight coppers out of one good one, thus doubling or tripling their money. Obviously, this latter only added to the counterfeits in circulation. A third reason existed. 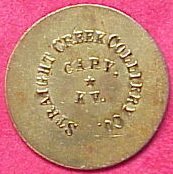 The large cities often had enough, or even an abundance, of low denomination copper coins. 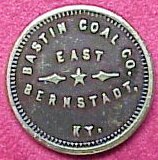 That most of it was “bad” coin was a fact, but at least it existed. 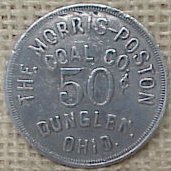 The small towns out in the “provinces” were often completely without coin. Money has a habit of flowing to the major trade centers, never to return. 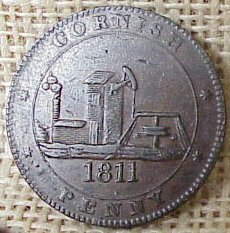 In 1787, the Parys Mining Company, who mined copper ore, made a decision. 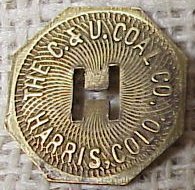 They had the copper, and they had access to coining presses. Located in Anglesey, Wales, they were out of the mainstream. 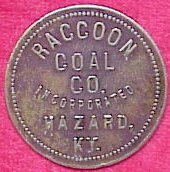 Little coin of any kind found its way there. They decided to make their own. 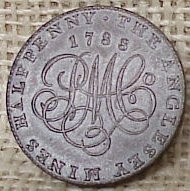 Beginning in 1787, they produced Penny and Halfpenny tokens (middle row below right), of the correct weight, nice design, and a edge legend that stated they were payable in Regal funds by them. 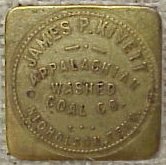 They were avidly accepted by the workers, and loved by the merchants. 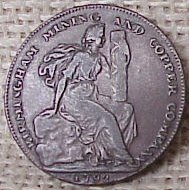 The mines themselves were important, there was now a supply of copper in Britain that had not existed before. 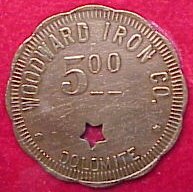 Planchets for copper coins could now be made locally, at reasonable cost. 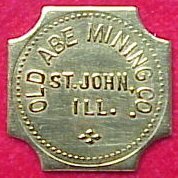 Likewise, the Hibernian Mine Company and the Associated Irish Mine Company which had mines in west and east Avoca respectively, began producing their own tokens. 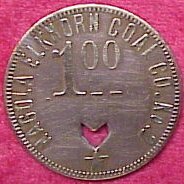 The "Cronebane Token", produced by the AIMC and named after the townland of that name in East Avoca, is probably the most beautiful of all the token coinage of that period. 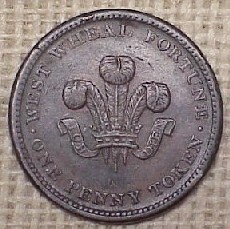 The obverse of the token shows a bust of St Patrick and the reverse a crest and shield of arms, which may be regarded as the Arms of the Company. 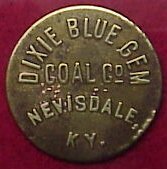 The shield incorporates crossed shovels, miners’ picks and a powder horn and is surmounted by a windlass. 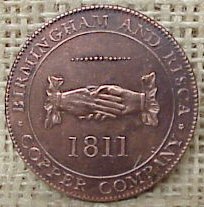 The first tokens were struck in 1789 at the Soho Works in Birmingham and it is probable that some of the coins were manufactured from Avoca copper. 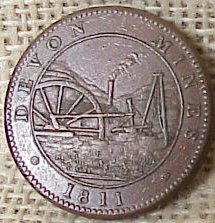 The halfpenny token illustrated above (below bottom right) was issued by the Associated Irish Mine Company for payment to their employees who were principally engaged in copper mining activities in the Vale Of Avoca in Southern Ireland. 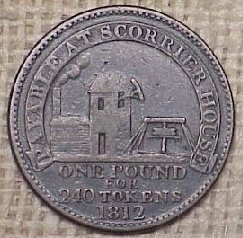 Such commercial tokens were mass-produced during the late eighteenth century by many British companies at a time when there was a shortage in circulation levels of official coin of the realm. 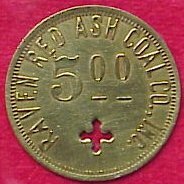 At a time of rapid industrial growth in Britain's economy it was important for concerns like the Associated Irish Mine Company (AIMC) to have a plentiful supply of "ready cash" to meet the demands of their growing business ventures. 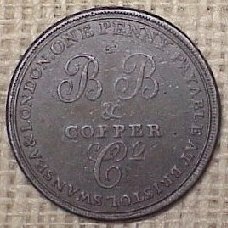 Despite calls from many quarters for the Royal Mint to produce new copper coin issues the British government was reluctant to act. 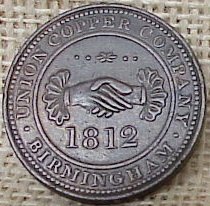 As a result the captains of Britain's Industrial Revolution were forced to enter into contracts with private mints (most of which were located in Birmingham) to produce the coinage that they so desperately needed. 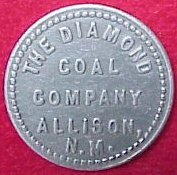 The Associated Irish Mine Company (AIMC) was established c.1787 by Abraham Mills (who was later to become Company Chairman), William Roe, Thomas Weaver the elder, Thomas Smith, Charles Caldwell and Brabazon Noble. 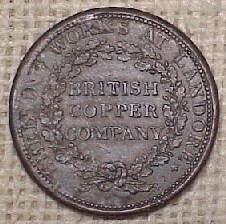 The company's principal concerns were in copper mining in the Wicklow Hills of Southern Ireland. The official offices of the company were located at 184 Great Britain Street, Dublin. 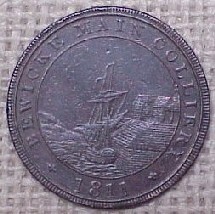 In 1798 the company was incorporated by an Act of Parliament. 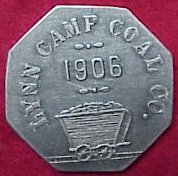 The AIMC's premier mine was located at Cronebane, across the river from Ballymurtagh, about two miles north of the present village of Avoca. 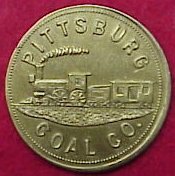 The company had a second mine half a mile south of Cronebane at igrony. 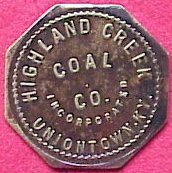 The Cronebane halfpennies carry the official Coat of Arms and Crest of the AIMC. 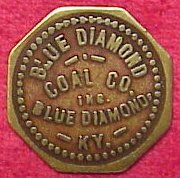 It is likely that this same heraldic device was incorporated into the design of the Common seal of the Company, which they were empowered to use by Act of Parliament. 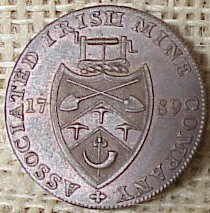 The tokens of the AIMC were extremely prolific and they, together with those issued of the Hibernian Mine Company (HMC), formed the basis of Ireland's currency during the late eighteenth and early nineteenth centuries. 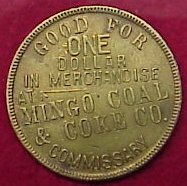 This shows how readily exchangeable and accepted such commercial tokens became. 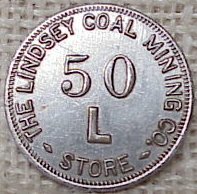 This is quite in contrast to the more limited mining "Truck" or "Tommy Shop" token issues which were also a feature of Britain's Industrial Revolution. 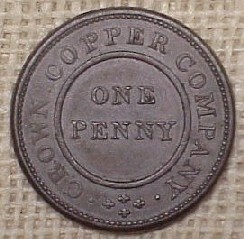 There are at least thirty varieties of the Cronebane halfpenny recorded many of their differences being very trivial. 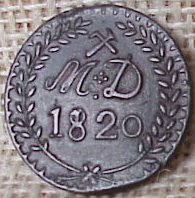 A further twenty-four contemporary counterfeit type and twenty die mules are also known. 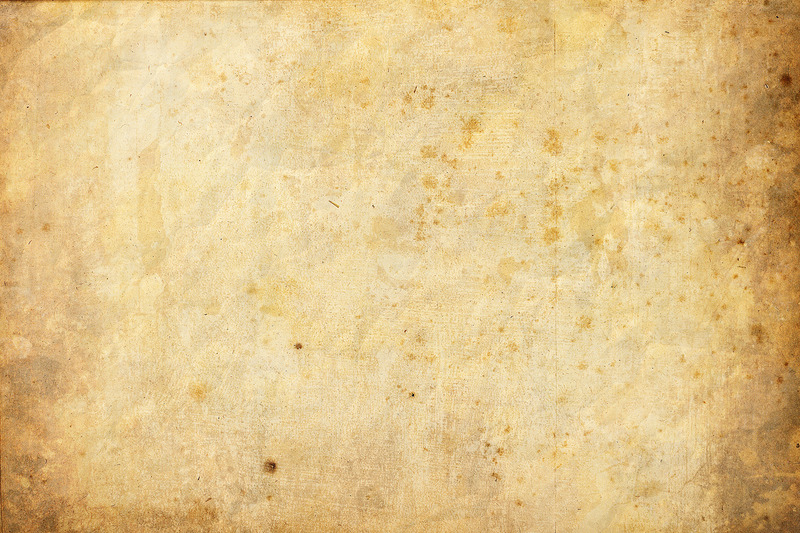 Issue dates range from 1789 to 1796.